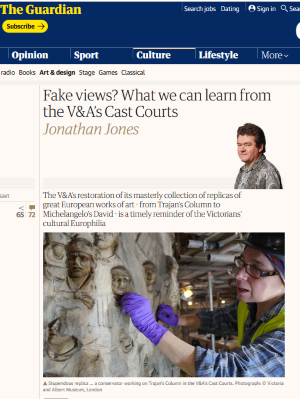 The V&A’s restoration of its masterly collection of replicas of great European works of art – from Trajan’s Column to Michelangelo’s David – is a timely reminder of the Victorians’ cultural Europhilia, The Guardian has argued. The full-scale replica of Trajan’s Column that stands in two halves in the V&A’s Cast Courts has always been a gobsmacking object to come across indoors. Now its interior is about to reveal a steampunk secret. As part of the restoration of the Cast Courts… a door has been opened at the base of this monument. What can be in there? The darkness reveals … a chimney. It turns out that with typically Victorian practicality the creators of the Cast Courts built two solid brick cylinders like industrial chimney stacks to support the two halves of this ancient – and modern – wonder. Why did they do it? … The answer is all around you as you meditate inside Trajan’s Column. The Cast Courts are relics of a cultural Europhilia that’s clearly not shared by modern Britain. These loving educational artworks bear witness to a passion to know, to see, and most of all to understand the cultural heritage of Europe: to bring the continent’s artistic jewels to these rainy shores. Just a handful of British monuments are replicated… German art treasures are displayed near the Templar effigies. There’s an immense flowing monument by Adam Kraft, carved in 1490-2, that’s a wonder of Renaissance Nuremberg: the V&A’s beautiful pale cast of this teeming panoramic relief lets you contemplate the pitiful faces of Christ’s mourners as they lower his body into its tomb. From Germany we jump to Prague in a black replica of the Czech city’s 14th-century statue of St George Slaying the Dragon. There are even several copies of wonderful works from Belgium itself, dreary home, modern Britons have been told so often, of EU sterility. The most impressive is a soaring pinnacle of columns, statues and spires from a church in Zoutleeuw. Long before the foundation of the EU, the Victoria and Albert Museum was at the forefront of a pan-European cultural movement…. The V&A’s comprehensive restoration of these masterly copies, freeing them from dust and equipping them with modern labels and a new section on the history and technology of artistic reproduction, is true to that original purpose….